This drum is composed of a resonant top resting on a flared torus, a cylindrical case, and asawn-off cone base; four double handles link the upper part to the central section. The whole instrument has a plane decoration of alternating geometrical motifs and stylized figurative images. The top is embellished with a central star around which are disposed various concentrically arranged scenes, no doubt related to long vanished fertility rites. These depict feather-decked warriors marching towards the dwelling of the deceased: a house on piles with a platform on which other figures are pounding grains of rice into drums. On the case, “ships of the dead”, decorated with heads and tails of birds, carry away warrior-spirits while similar warrior-spirits alternate with geometrical motifs on the vertical body of the instrument. Cast in bronze using either a compartment mould or cire perdue technique, such drums are found in the tombs of high-ranking figures. Also known as “rain drums”, they were apparently widely used, not only in certain fertility cults but perhaps also in the majority of communal or clan rituals. 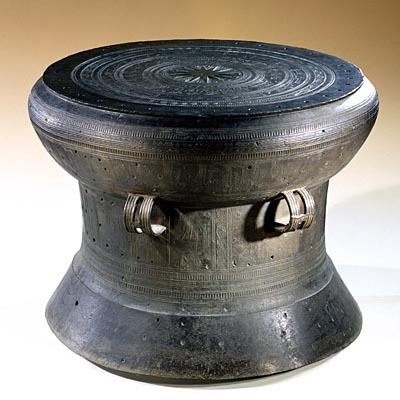 Large bronze objects occupy a particularly significant place in Dong Son art and their style, essentially featuring geometric and animal motifs, displays great homogeneity. This culture, the name of which derives from the eponymous Dong Son site, emerged during the late Bronze and early Iron Age and its powerful influence extended as far as the Indonesian archipelago. Its social organization was based around large, rice-growing, village communities, apparently linked together in a tribal confederation. These drums attest to well-organized trade and political networks enabling the chiefs to procure the necessary materials involved in their making.